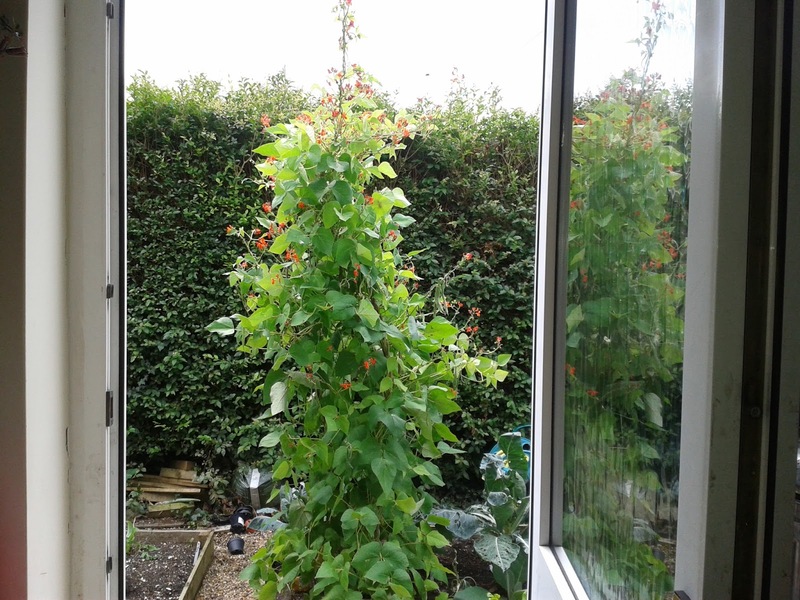 I love the view of beans growing right outside my kitchen door. We are really lucky and have a dedicated fruit and vegetable garden right next to our kitchen. Even better than that my husband has got really into growing vegetables. 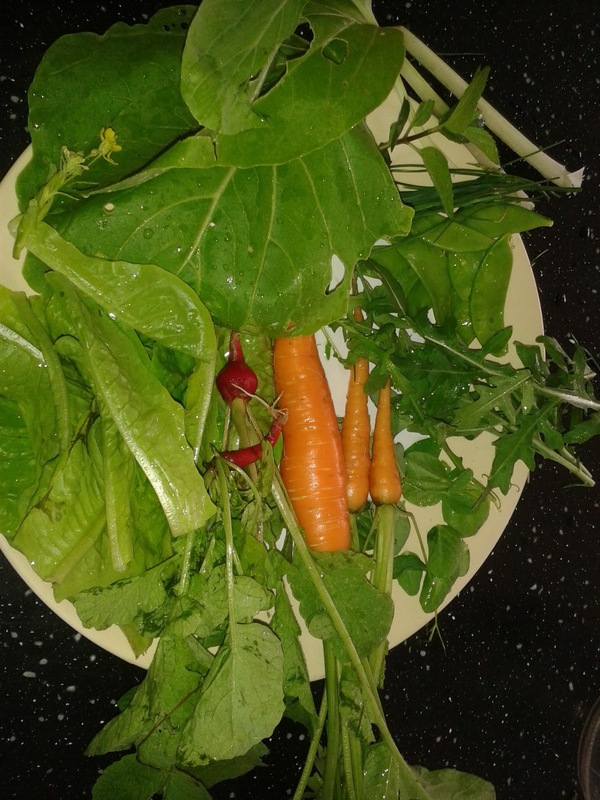 So every day I get to go out there and pick salad for my lunch, which I think is great – thanks Mr M! 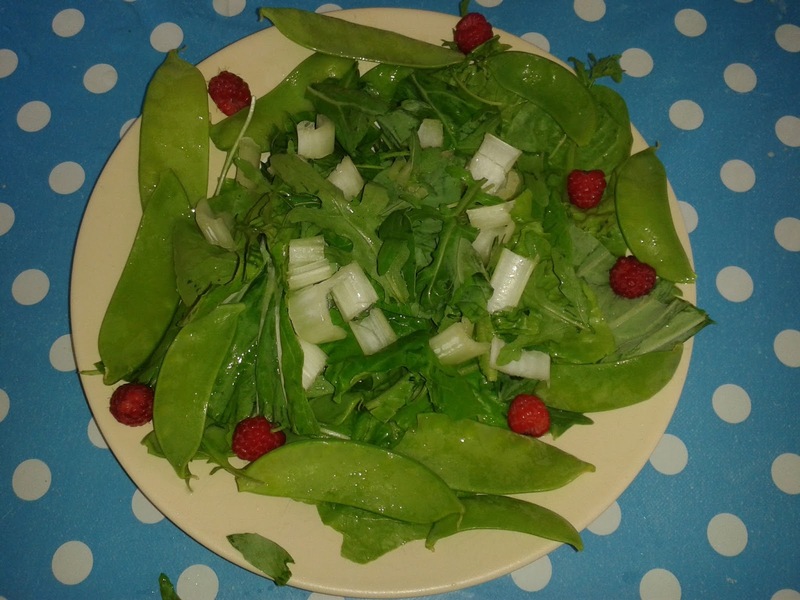 My salads have been made up of homegrown little gem leaves, pak choi, radishes, mange tout, sugar snaps, pea shoots, rocket, chives and then either mint or lemon balm. Just recently we have started eating carrots from the garden and we have tomatoes coming, but unfortunately no cucumbers as yet. We have no raspberries at the moment, but while the supply was good I added a few of them to my salads as well. I don’t know how much longer I will have of picking my salad every day, but I have definitely been enjoying it while it has lasted! It has saved us money as well – I have had a large bowl of homegrown salad every day for weeks and although the pak choi is on it’s way out, other things are still going strong. In fact I have had so much salad that it has been going in stir fries once or twice a week as well! I reckon we have saved ourselves around £6 to £8 a week at organic prices for salad, which is great! Have you been eating homegrown salads this year? What have yours been made up of? This entry was tagged eco, Food, fresh, Frugal, garden, Gardening, Green, grow your own, homegrown, local, organic, salad, summer, thrifty. Bookmark the permalink. ← My top five free summer days out near Brighton with kids! Looks delicious 🙂 got home grown lettuce at my mothers house and I always enjoy it! Those salads sound and look great! You must be the healthiest person in your neighborhood. Oh lucky you! We've had a rough season this year with way too much rain. So we got a few cucumbers but not as many as I would have liked. We are getting tons of eggplants and tomatoes. We've been enjoying tomato salads daily! Thanks for sharing your lovely garden with us!